The model a also had half the ram does it not? According to the link in the article, the A does indeed only have 256mb. But still the same fragile aluminum cap! The new revision of the B board has screw holes. And then you save money exactly how? Or put otherwise, the same amount of RAM as the original model B! Not that I’m bitter or anything. Not a hack! Just another ad for Pi vaporware. Fact of the matter is that, while initially tricky to come by, Model B’s are very much a real thing — the rPi team has delivered on their primary SKU, and (while I believe it’s been delayed), this shows the Model A’s on it’s way; there’s no reason to think of it as “vaporware”. Also, a lot of really cool hacks/projects have come out of the rPi already, and more are certainly on their way. It’s the cheapest multimedia media SoC development board I know of, and it’s constructed fairly intelligently for a wide variety of users and use cases, with a large community around it. Not to mention there’s some legitimate power in a small, cheap package, so just hating on it because it’s popular doesn’t make any sense. TL;DR: Don’t try to start a fight. Aren’t we all here because we share a love of hacking around with hardware and software? Translation: A lot of really lame advertisements for Broadcom by HaD have come out already. > and more are certainly on their way. Translation: While HaD continues to get kickbacks from Broadcom, this policy will continue more aggressively. > so just hating on it because it’s popular doesn’t make any sense. HaD needs to come clean about their relationships with the “RPi foundation”/aka Broadcom. For many of us who read HaD, RPi “projects” are nothing more than paid advertisements for the benefit of Broadcom. It’s OK to have ads, but when you masquerade ads as “cool hacks”, you might as well just change your name to BaD (Broadcom a Day). agreed. Hackaday as far as I’m concerned is just a paid promoter at this point, maybe posting an actual “hack” every other day to keep people thinking they show hacks. Writing this comment from my Raspberry Pi Vaporware Model B with 512MB RAM.. Yeah, seems to be vaporware! Nobody said your Model B was vaporware. It’s the Model A that this thread is about! And since the Model A hasn’t been made yet, that makes it vaporware to me. And no, I haven’t posted about the RPi before, although I was tempted to post to the RPi camera module the other day that it also was not a hack, but just an ad for something that isn’t available yet, ie vaporware. I have nothing against RPi hacks, like the mini MAME cabinet, the PBX interface, or even the three daily posts of a RPi in a quadcopter. But ads for future releases? Blah! About as many Pis have been shipped as official Arduinos. I suppose you consider Arduinos vaporware too, then? How many Pi Model A’s have been shipped? Please tell me exactly which parts you could remove to save more than $2 off the final delivered price? All the shaped connectors are ≈25¢ in quantity and the DIP headers are basically free. Almost all the cost here is in the 6-layer PCB and the CPU+GPU combo. This is true, the 6 layer board is prolly pretty a good part of the cost. I’m curious of the BOM and coresponding prices they get for their parts (like mag jack, HDMI conn, proc/ram, eth2usb controller etc. I’ve pretty much exclusively used the composite out. And this thing is $25, *surely* you’re not trying to complain that it’s too expensive? If so, you’re NUTS. Well, the model B is more like $50 when you want to get it in euro side of the pond. The rPiB is not suited for everything but still cool for many very interesting projects. I like the RPi a lot (I have two of them) but I wish HaD would publish actual hacks, not just Pi announcements. 4 posts since the last RPi post…. I read that as Hacks using the Pi, not just news articles. 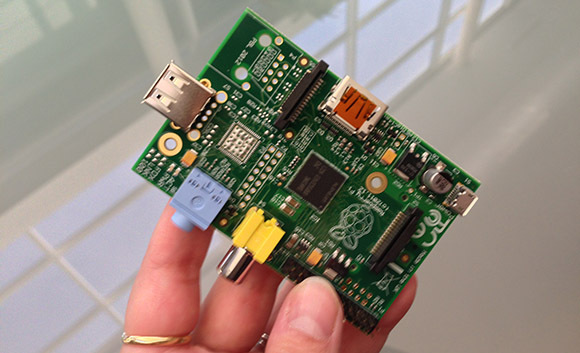 I would love to see more RasPi projects. Would like to see more AVR tiny/Mega projects as well. I have the “B” model but other than booting it up and logging in I can’t see any real use for it. Even the most basic useful stuff doesn’t work on it. You can’t even make it a USB web cam streamer – the mjpg_streamer of course doesn’t work? May be it’s just my lack of uber geek knowledge but really, I am stumped why the thing is so popular? Really no uses? I have one that can program both Arduino’s and Parallax Propeller’s, on top of it’s own GPIO ports. XBMC runs fine on a 128/128 ram split, and most regular linux apps are all downright usable. And it’s all portable and dirt cheap. With a powered usb hub, and wifi dongle this A model is just as competent and 25$, compared to the initial B models. It’s also a nice platform to program on as well. You may want to look through The MagPi magazines and search for “Raspberry Pi” on HaD for projects ideas. There are pure software, pure hardware and a mix hardware and software projects that people have come up with which may give you some ideas either to start a new one or improve upon an existing one. For anyone wondering about the single vs. dual USB between A and B, the SMSC LAN9512 chip that the Model B has isn’t just 10/100 Ethernet, it’s also a USB hub with the Ethernet system integrated. In the Model A, the Broadcom SoC’s single port is connected to the output port via two jumper resistors (assuming 0 ohms, I just looked through the B schematic and the option for resistors was there). In the Model B, the Broadcom SoC’s single port connects to the LAN/Hub chip which provides the two USB2.0 ports as well as the Ethernet capability. I did not know this and was assuming that the SoC had more than one USB interface and that you may be able to solder in a second port, but that’s not the case after looking at the schematics. So then, solder in a 2 dollar usb hub chip.